A week ago we were at a friend's wedding, This is my Little Tyke, in a moment where I was sat down resting my weary legs while Daddy took over the childcare. I have to be honest, she was in an awkward mood, a little obnoxious, a little bored and tired......not the best combination ! 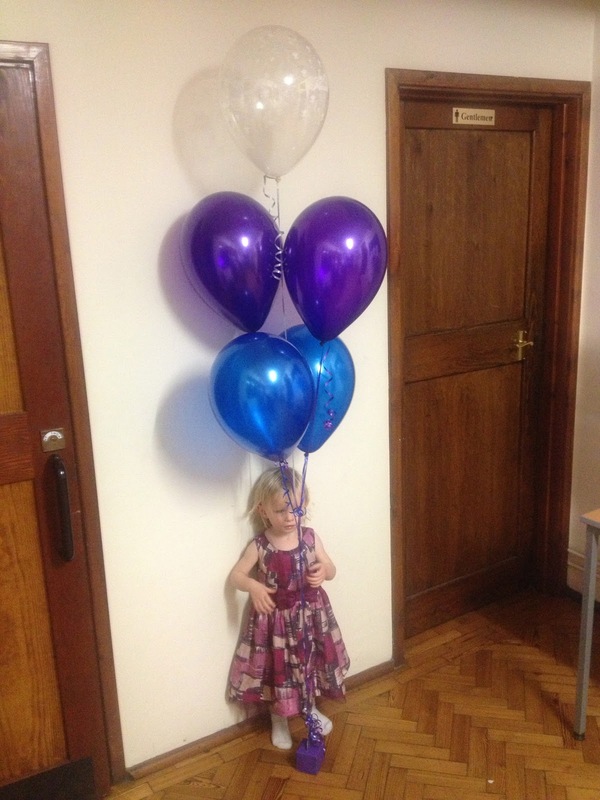 Thankfully there were balloons, and she loves them, really loves them. Infact, today we visited some lovely friends, I asked her at bath time if she'd had a nice time at their house, she just looked at me, and said 'no balloons', I think that demonstrates how she measures things right now. Alas the purple balloon has met it's end. Half term is over, the purple balloon provided a week of entertainment for my little two year old loopy lou, on to the next week without it.